Though specializing in playing hissable heavies, the tall, slender 6' 1" blond, blue-eyed George Peabody Macready was actually a cultured and expert art collector, as was his good friend Vincent Price with whom Macready was partners in a Los Angeles art gallery. Born August 29, 1899, in Providence, Rhode Island, he claimed (probably correctly) to be a descendant of the great 19th century Shakespearean actor William Charles Macready. George’s parents were George Peabody and Grace Clark, both of Rhode Island. George acquired an Ivy League education by attending Brown University studying Greek and mathematics. His first job was as a reporter in the early ‘20s for the New York DAILY NEWS. He later studied at the Boleslawski Theatre in New York and pursued a career on the legitimate stage, commencing with the Jesse Bonstell Theatre in Detroit, Michigan. He made it to Broadway with appearances in plays such as “The Barretts of Wimpole Street” and “Romeo and Juliet”. 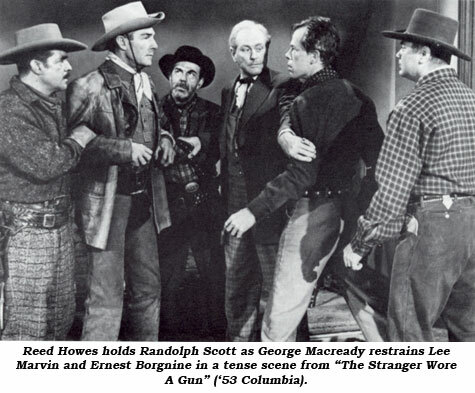 Making a name for himself in “Victoria Regina” in 1937 with Vincent Price and Helen Hayes, his next stop was Hollywood in 1942 under contract to Columbia for “Commandos Strike at Dawn”. Macready remained at Columbia for four years during which time he essayed scheming prime ministers, haughty politicians and—the scheming Professor Ernst in “The Monster and the Ape” serial (‘45). 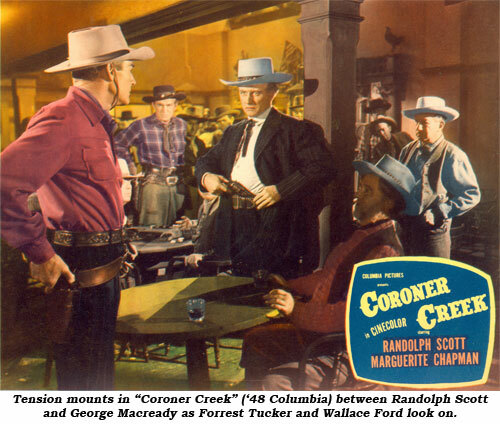 It was 1948 before he came to westerns, but who can forget his portrayal in “Coroner Creek” of renegade Younger Miles who led a band of Indians in a stagecoach raid in which Randolph Scott’s fiancée is killed. By the time Scott’s long trail reaches Macready he is now a greedy freight line owner who readily abuses his wife. He’s ripe for killing—as he was for the next 15 years in film and on TV. 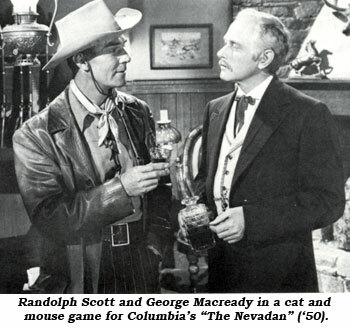 In addition to westerns he was memorable in “I Love A Mystery” as Jefferson Monk, “My Name Is Julia Ross”, “The Big Clock” as Charles Laughton’s toady, “Gilda” as Rita Hayworth’s despicable husband and “Paths of Glory” as a cold-blooded French general. He was also among the regular cast of TV’s “Peyton Place” (‘65-‘68). Once married to actress Elizabeth Dana, they divorced in ‘42, but the marriage lasted long enough to produce a son and two daughters, including minor producer Michael Macready who featured his father in Macready’s last film in ‘71, “Return of Count Yorga”. 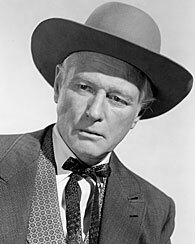 One of the classic screen heavies died at 73 July 2, 1973, of heart-failure while at the University of California Hospital in L.A. where he’d been a patient for two days. His remains were donated to the U.C.L.A. Hospital Pathology Department for medical research.